Patti has been studying and teaching belly dance for 17 years. Patti’s instructional style is detailed, supportive, and filled with humor, and she draws on her extensive classroom experience in educational settings ranging from elementary school to secondary and adult education to make her classes inspirational and fun. Patti is passionate about the transformational power of dance in general, and belly dance in particular. In addition to instructing and performing, Patti is also the past President of ACCMED (Association of Central Carolina Middle Eastern Dancers), previously the area’s only professional organization for middle eastern performers and instructors, and is the owners of World In Motion, the dance studio that is her dream come true. She is also a proud member of Dayanisma, the area’s sole professional tribal performance troupe. Patti strives to make physical accommodations for her students whenever possible so that people of all abilities can participate in this beautiful art form. Patti’s goal for World In Motion is to provide a warm and encouraging environment where students and teachers can dance, drum and dream together in a true labor of love. Patti teaches Fundamentals of Tribal Belly Dance on Mondays. Dawn has over 15 years of experience instructing and performing at events across the country and specializes in ATS® and tribal style belly dance. She has received her Teacher Training level 1 and 2 certifications from Carolena Nericcio-Bohlman of Fat Chance BellyDance® and has achieved Sister Studio status. Dawn also has the honor of being selected for the first FCBD® Advanced Teacher Training in June 2015. In addition to belly dance, Dawn has studied the Indian dance style, Kathak, and incorporates elements of this, Bharatanatyam, and dances of Rajasthan into her dance repertoire. She draws on these and other styles, influences, experience, and use of props (skirts, single and double pots, swords, fans, baskets, etc.) to create flowing, graceful choreographies and improvisations filled with beauty and life. Dawn performs as a soloist and also as the co-director (along with Lisa Allred) of Dayanisma, her professional American Tribal Style® belly dance troupe. Many of Dawn’s students have gone on to perform throughout the United States and some have become instructors themselves. Dawn lives for the dance and strives to pass on the forms and her generations of dancers. 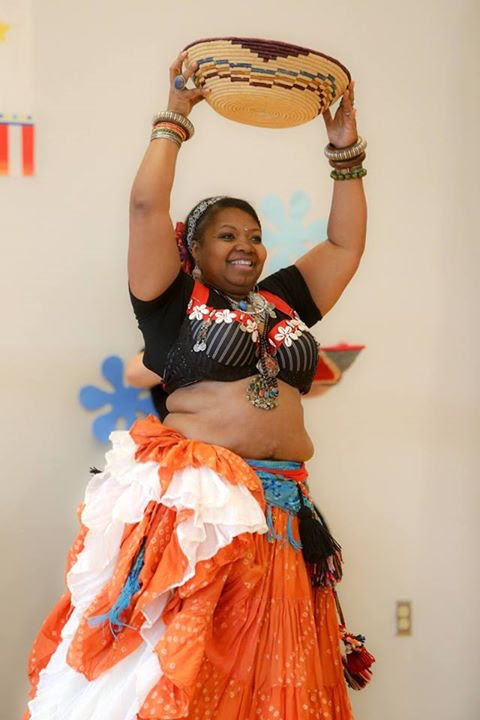 Dawn teaches Intermediate Tribal Belly Dance on Mondays, and Advanced Tribal Belly Dance on Saturdays. Emily has been delighting audiences and inspiring students since she began bellydancing at the age of 15. With over 10 years of teaching experience, Emily blends her knowledge of both tribal and cabaret styles to create her own unique style of bellydancing suitable for both beginning students, the more advanced dancer, and anyone in between. Her verve, creativity, and passion for the dance is evident in both her warm and accomplished teaching style and her brilliant performances. Emily is the founder and director of the geek bellydance troupe, The League of Extraordinary Bellydancers. Emily loves teaching weekly classes at World In Motion, which she co-owns with Sashi. Emily is the director our fabulous student performance troupe, Raqs al Dunya, and she teaches Tribaret Belly Dance on Thursdays . Karen has been a student of belly dance since 1995 when she attended her first dance class completely against her will. However, she was hooked after that class and has been dancing ever since! She is thrilled to be a member of Dayanisma and to have the opportunity to dance with these amazing and talented women. Karen was first exposed to American Tribal Style® dance when a troupe mate found a video cassette of Tribal Basics: Volume 1 many moons ago and was immediately drawn to the beauty and style of ATS® . As there were no teachers in her area at that time, Karen gathered all of the videos she could find and learned as best she could. She ultimately discovered Dawn Ruckert of Dayanisma and has been studying with her for the past eight years. Over the last 22 years, Karen has studied Modern Egyptian, Turkish Folkloric and Spanish Fusion belly dance but her passion lies with American Tribal Style® . She was a member of Sunanda Tribe under the direction of Dawn Ruckert prior to joining Dayanisma. Karen lives in Mebane with her wonderfully supportive partner George. She has four wonderful children and three exceedingly exceptional grandchildren. Laylianah is an experienced instructor who has been teaching Belly Dance in the Triangle Area since 2010. She has studied many styles of belly dance with world renowned instructors, and is excited to share her knowledge with you! Laylianah will teach you much more than a simple series of movements. You will learn correct and safe technique to keep you dancing into your old age. You will also learn about the cultural heritage of the dance, and how it relates to the music. Laylianah prides herself on providing a fun and supportive atmosphere for all her students. She looks forward to seeing the self-confidence that Belly Dance will help you develop! Laylianah teaches Beginner Cabaret Belly Dance on Tuesdays, 6:45 – 7:45 pm and Intermediate Cabaret Belly Dance on Tuesdays, 7:55 – 9:10 pm. Li has been bellydancing since 2005 and has studied a variety of dialects and facets of this dance form from Raqs Sharqi to Tribal Fusion to American Tribal Style® and she loves them all! She brings her passion for community, communication, expression, and research to the studio to offer a clear, challenging, and vibrant session to beginning and advanced dancers alike. She teaches Explorations in Belly Dance and Expressions in Fusion Belly Dance on Wednesdays, ATS® Flow on the third Sunday of each month and is the creative director of Sunanda Tribe, World In Motion’s tribal student performance troupe. Outside of class, Li spends time practicing, studying, and performing with Dayanisma (an ATS® troupe under the co-direction of Dawn Ruckert and Lisa Allred). Aparna has been practicing yoga for the past 6 years, but it was 2 years ago that yoga truly started having a profound effect on her life off the mat. She found herself to be happier, calmer, stronger, and kinder. As both a yoga teacher and engineer, Aparna’s goal is to give others the same peace of mind she has received from her past and present yoga teachers, helping yoga extend beyond the hour you spend with her on the mat. After completing her 200-RYT training program in Hatha Vinyasa Yoga under Susan Jackson of Innerlight Yoga School, Aparna is thrilled to share with you her experience, energy and positive vibes! “The ultimate goal of yoga is union with our own true nature. We might not all get there, but whether you dip your toes at the edge of a deep lake, or dive right into the middle of it – you still get wet. Any time spent (no matter how much) working to improve our mind, breath, and body is time working towards understanding who we are”. Aparna teaches Hatha Yoga (all levels) on Sundays. Anna Jewell is an experienced yoga teacher in the Raleigh area. Yoga & Mobility—her class at World In Motion—interweaves traditional vinyasa yoga with mobility exercises and physical therapy inspired strengthening. Strengthening and moving from the core are emphasized so that we are able to cultivate more lightness and freedom, both on the mat and off. This class is open to anyone ready to sweat, play, and expand their limits. More info about Anna can be found here. Jennie has been a student of dance most of her life. Branching out from a childhood foundation in ballet, jazz, and modern, she has explored a variety of ethnic and folkloric dances from across the globe including West African, Brazilian, and ballroom dance. Investing in her passion for globally connected improvisational dance, she was certified in American Tribal Style® General Skills by Carolena Nericcio-Bohlman of Fat Chance Belly Dance® and Megha Gavin of Tribal Pura International®. She also achieved Sister Studio status as an ATS® Teacher in January 2017. A professional background in community health education gives Jennie a unique skill set for communicating concepts to diverse populations, practicing dance safely, and building community through movement. Jennie began performing bellydance with student troupes in Greensboro, NC in 2012. She is currently performing with Dayanisma (an ATS® troupe under the co-direction of Dawn Ruckert and Lisa Allred). When not dancing, Jennie enjoys crafts, costuming, and having adventures with her growing family on their little urban homestead. Jennie is currently on maternity leave but hopes to be back teaching class at WIM soon! Lisa Allred has a background in ballet and modern dance and has been bellydancing since 2005. 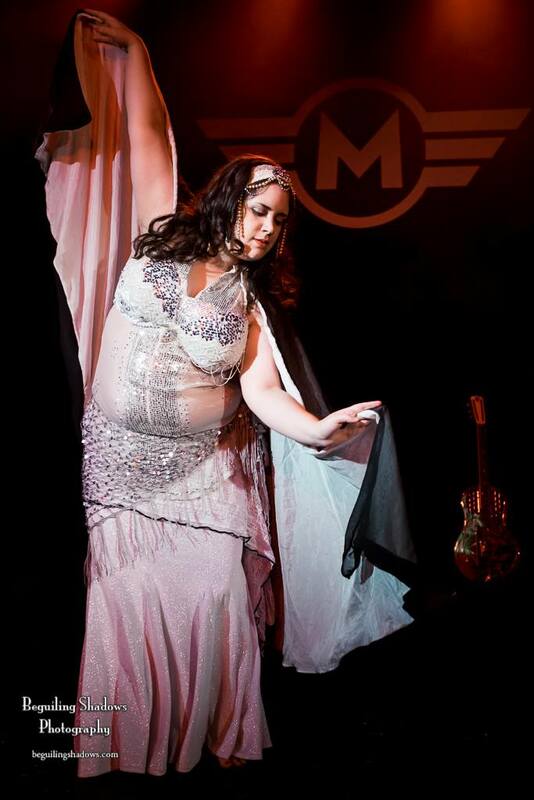 She has studied Spanish-Arab Fusion, Cabaret, and American Tribal Style (R) bellydance. Lisa performs around the country with two professional troupes: Dayanisma, which she co-directs with Dawn Ruckert, and Third Eye Tribal. She also teaches for the on-line Belly Dance Business Academy. Lisa is a licensed therapist with years of experience working with children, adults and families. Lisa understands that many people decide to take a bellydance class as a fun way to exercise and meet new people. With this in mind, she prioritizes getting a good workout (via learning dance technique and drilling) with finding ways to build community (for example, having students introduce themselves at the beginning of each session). In her classes, you can expect to dance hard and laugh harder! Lisa teaches periodic workshops including ones for kids and teens, Parent/Child Belly Dance, ATS® special topics, and Stage Presence as well as other exciting themes. Debbie’s love for ATS® began in 2010 at the home studio of Patti Beaman, owner of World In Motion. Since then her main focus in dance has been ATS®. Debbie received her General Skills and Teacher certifications from FCBD® in 2017 and now assists in several classes as well as substitutes whenever she is available. Sara has been teaching bellydance to students of all levels since 2003. Sara’s first priority as an instructor is making sure that each and every student in her classes has the resources they need to grow into a well-rounded dancer– clear movement instruction, information about safe technique, and helpful and specific feedback. Her experience as a student of multiple styles of bellydance enables her to make her curriculum accessible to students from all backgrounds. Along with Blue Moon Dance Company, she’s taught workshops at Triboriginal 2009, Duke University, Meredith College and Campbell University. She has given lectures about bellydance history and culture at UNC Chapel Hill and Duke University, and was a featured instructor at Waking Persephone in both 2015 and 2016 and the Asheville Bellydance Festival in 2011. Sara is currently on hiatus and hopes to return to teaching belly dance in the future.